Step 1 takes place during ordinary medical consultations. Venous disease patient screening was performed over a short period of time. GP completed a case report form assessing the patient’s history, list any CVD risk factors, screen for CVD symptoms, and perform a routine leg examination. If the patient showed signs of having any CVD symptoms, they were asked to complete a short quality of life questionnaire. The ChronIc Venous Insufficiency Questionnaire-14 (CIVIQ-14) is a 14-item questionnaire that profiles three aspects of life: pain and physical, and psychological function. Step 2 is a follow-up of the patients that the GP decided to refer to a venous specialist. 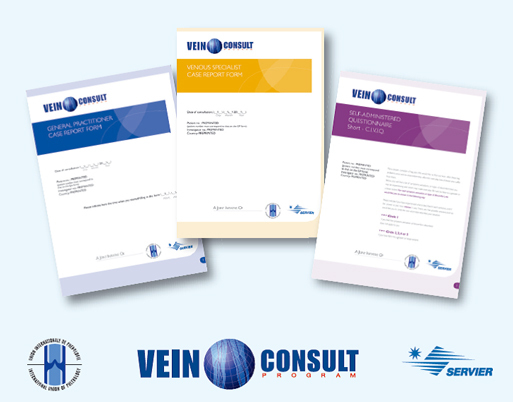 This second step will be implemented by the venous specialist. The venous specialist completes a 21-item questionnaire to establish the patient’s history of CVD, risks factors, carry out a lower leg examination, and assess whether treatment is required. The results of these 2 screening steps will help to characterize the typical CVD patient and also help establish the prevalence of CVD.